publishing world: she designs and paints the breathtaking covers for her bestselling fantasy novels. An artist, an author, a musician and a sports enthusiast, Janny is a woman of many extraordinary talents. She is the author of eleven novels, a collection of short stories, and the internationally bestselling Empire trilogy written in collaboration with Raymond E. Feist. Her current release in her Wars of Light and Shadow series, is Peril's Gate (Eos) which is the culmination of more than twenty years of carefully evolved ideas. Her award-winning paintings have been showcased in exhibitions of imaginative artwork, among them a commemorative exhibition for NASA's 25th Anniversary; the Art of the Cosmos at Hayden Planetarium in New York; and two exhibits of fantasy art, at both the Delaware Art Museum, and the Canton Art Museum. As a young girl growing up in a small town, Janny was an avid reader, devouring everything that the local library had to offer. She loved science fiction and fantasy, and actually wrote several novels while still in high school. 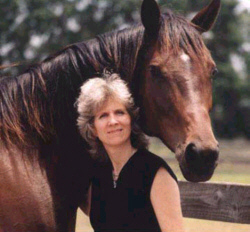 She loved horses and the outdoors, and was fascinated by the world of science. She enjoyed writing, but felt she hadn't really seen enough of the world to be an author. After graduation and a self-financed trip to Europe to see the world, Janny knew that she wanted to create something spectacular, something with breadth and scope. While still in college, she conceived the idea which was later to become the foundation for an epic bestselling fantasy series entitled The Wars of Light and Shadow. But she was also drawn to painting, and first achieved success as a commercial illustrator for the major New York publishing houses. But she never gave up her dream of not only designing book covers, but of writing the books themselves. After years of honing her craft, Janny sold her first novel, Sorcerer's Legacy, which was published in 1982. It was followed by the Cyle of Fire coming of age trilogy: Stormwarden (1984), Keeper of the Keys (1986) and Shadowfane (1988). Raymond E. Feist, author of the bestselling Riftwar saga, asked Janny to co-author a series set on the Tsurani world around the Lady Mara and her struggle to survive in the vicious politics of her home world. The resulting Empire trilogy of Daughter of the Empire (1987), Servant of the Empire (1990) and Mistress of the Empire (1992) was an international bestseller and vaulted Janny into the spotlight as a fantasy author to be reckoned with. But the project for which she is best known is her epic Wars of Light and Shadow series. Publisher's Weekly says of Wurts' writing in the series, "Wurts is an accomplished builder of worlds, scenes and characters through well-chosen detail, with an ear for dialogue and an eye for realism." Booklist praises the series' "endless twists and turns of plot and an artful complexity that is marvelous to behold." The Wars of Light and Shadow is a sweeping epic, which consists of six books so far: Curse of the Mistwraith (Penguin/NAL, 1993), Ships of Merior (HarperCollins, 1994), Warhost of Vastmark (HarperCollins,1995), Fugitive Prince (HarperCollins, 1997), Grand Conspiracy (HarperCollins, 1999) and her latest release, Peril's Gate (HarperCollins/Eos). The Wars of Light and Shadow follow the fortunes of two half-brothers: Lysaer s'Ilessid, called the Lord of Light, and Arithon s'Ffalenn, called the Master of Shadow. The brothers are exiles on the world of Athera, the original world of their ancestors, where they are prophesized to defeat the Mistwraith which encircles the world in constricting fog. The brothers unite to destroy the Mistwraith, but at a terrible cost. The Mistwraith curses the two brothers to hate each other, and to continually be at war. The brothers' battles encompass the entire world, as all are drawn into the conflict. The series is full of adventure, politics, intrigue, romance and magic, and is known for its lyrical writing and depth of characterization: this is a series for people who like to think. There are more books to come in this series, and she is also working on a new stand-alone. When she's not writing or painting, you might find her spending time with her husband Don Maitz, hiking, horseback riding or skiing. Janny spoke with us about her latest book, Peril's Gate, and how she creates her compelling characters, fantasy worlds and intricate magical system. She also gives some some fantastic in-depth writing advice for aspiring authors. My love of stories began with being read to, aloud, as a child. Kipling's Jungle Book and Mowgli Stories were early favorites. My enjoyment of reading came later, and in fact, almost went off track entirely. The material used by the school system to teach reading quite simply failed to engage my attention. Since my own adventures, out in the woods were more fun, reading languished -- I hated it! While still in first grade, by sheer chance, I was messing about in my older brother's room (who didn't?) and there I encountered a copy of Walter Farley's Black Stallion. Since I was enamored with horses, that was worth reading! So I learned to read on Walter Farley, and got hooked. From there, I devoured the fiction section in the library, anything and everything that had adventure in it. This included historicals, mysteries, classics, faerie tales -- including more literate works like Stone's The Agony and the Ecstasy. The small town library where I grew up had perhaps five science fiction and fantasy titles, total. I didn't encounter that branch of fiction until much later. Zelazny was one of the first, and I think I discovered Andre Norton on an airplane trip to Outward Bound in Minnesota. So reading and woods rambling and horses were my early pursuits. The pursuit of reading built my foundation in vocabulary. The knowledge grew naturally, by encountering words in every sort of book. I devoured every novel and nonfiction book I could find by Daniel P. Mannix, a naturalist, and later, this led to my renting a carriage house apartment on his property for thirteen years. People often ask what writers influenced my work, and honestly, there are far too many to remember, far less attempt to name. What was the first thing you ever wrote? What reaction did it receive? Well, I wrote a children's story, a fantasy, in junior high school. Not a school assignment, something I tried for myself. I actually did submit it to publishers -- it got rejected, naturally. That didn't seem to stop me from writing two and a half more novels, while in high school -- science fiction/fantasy hybrids, which were done, oddly enough, before I encountered science fiction at all, beyond Madeleine L'Engle's Wrinkle in Time. I loved science classes, and seemed naturally drawn to the realm of the imagination. None of those early novels were ever submitted. They were hand written on notebook sheets, stuck together with brads, with crudely drawn covers. The plots weren't terribly sophisticated, but they were complete. As 'trial runs' they were wonderful practice! I learned the rudiments of pacing, character development, dialogue, and the satisfaction of finishing a project. In the exuberance of being a teen, and feeling invincible, I never paused to tell myself I couldn't do this. The trust, that I would proceed a page at a time and arrive at a plausible ending, was a valuable thing to learn early. Just fly with an idea, and see where it might go in the blind presumption it will work out, is a wonderful approach to creativity. Sure, I got teased by my classmates -- "Wurts is always writing these crazy stories..." But that never seemed to matter. I'd get out of school, go out in the woods, and get more ideas and write them out later. I did have a sense that these stories were practice, that I would write other novels later, though if anyone asked, I insisted writing would never become a full time career. I'd like first to talk about The Wars of Light and Shadow and your latest release, Peril's Gate. How did you first conceive the idea for this series? The idea began as a tiny seed -- just the concept -- of two brothers, one fair, one dark, who would be set into conflict. Contrary creature that I am, I decided right then that one would seem heroic, would do all the moves of the "hero" type -- but that the other would be the character to define the qualities of heroic compassion. Maybe being the brunette among a bunch of blond sisters, I was sick to death of the faerie tales, where the villain is always dark, and the fair always represents good. Perhaps, in a fit of rebellion, I decided for kicks to turn that misconcept onto its head. Whatever the whim, the idea took hold and became serious, very quickly. I saw a story that would be complex and multi-faceted, and I let it go -- the world, its immense back history, a huge chunk of evolved language, ran into pages of notes, all set in lock step with development of my earliest concept of the plot. I had a young horse, at the time, that I had paid for and trained myself, and I sold her to finance a trip to Europe. I realized (as a kid just out of high school) that I needed more life experience to write this massive story. I felt I had to step beyond my backyard and see more of the world before I could design Athera, with its history and its worldly cast of characters. I wanted the "real" feeling of standing on a mountain top, or sailing in the open ocean, and I needed to encounter other experiences and cultures. Throughout college, and just after, I went on to Russia, Africa, and Korea. I did 3600 miles of offshore sailing on small boats. Took fencing, learned archery, and took wilderness trips. Studied botany, geology, astronomy, oceanography...all background that satisfied my intense curiosity, and also, laid down the foundation to write a story that would feel like a real experience. That seemed of paramount importance: to create, not just a story, but an event the reader could encounter as though they were a living participant. Years went into this idea, watching it snowball, letting it grow and deepen and connect. When you began the series, how much of the master plan did you create before you wrote the first book? Have you had to alter your plan at all during the process of the writing? That seed idea actualized itself -- I had the concept, I knew who the characters were, I had a conflict -- I wrote the opening bits, fifty pages or so, without any real awareness of the scope it was going to encompass. Yes, I had a crude sort of outline -- one single spaced page and a half -- and most of what's there is still recognizably embedded into the tapestry. But where I thought I had one book, the masterful depths had yet to reveal themselves in the tale. Of course, I started the draft in the wrong place -- I had to really study and know my craft to finally arrive at the beginning. The original plan has not so much altered, as deepened. Tremendously deepened. I realized I had too much to tackle as a young, starting writer -- and too much to encompass all at once. So I sold a first novel that was relatively simple and straightforward, (Sorcerer's Legacy) then did a trilogy ( Cycle of Fire) and another novel, ( Master of Whitestorm), while staying committed to the Light and Shadow series as a long-term project. This allowed the story to flesh out without pressure, and also let me get more mileage as a writer. "I often feel that I don't create the stories, so much as they direct me...the concept frames itself, and the characters react according to their beliefs and preferences. It's like tossing a marble into a pinball maze -- you know where it enters, you know where it's going to exit, but the course it takes getting there is the event that fascinates." was always in mind. I permitted its ideas to surface and accrete, and jotted notes like crazy -- fragments of future scenes, bits of history and background for places and cultures. I set down what arose whether or not I knew where it would fit -- when the muse spoke, I recorded it, and didn't question or throw anything out. I guess I intuitively trusted I would find out in due time, when and where the jigsaw fitted together. If something popped in I didn't expect, I just let the anomaly rip. Always, later, I'd realize, "hey, this goes here, and this connects to that, and wow, look at this, it's part of this incredibly intricate synergy between this bit and that." This is the fantastically fun part of creativity -- watching that dream assume its own shape and dimension. I often feel that I don't create the stories, so much as they direct me...the concept frames itself, and the characters react according to their beliefs and preferences. It's like tossing a marble into a pinball maze - you know where it enters, you know where it's going to exit, but the course it takes getting there is the event that fascinates. I go into a scene, knowing where it starts, and aware of how its theme of conflict will resolve, and then just let the characters fly on their own merits. I suppose that's why readers say my stories are not predictable -- because I don't set out to "do the story" -- I let the story "do itself." Yes, absolutely, I know the ending before I get there. The whole process is not an act of random chaos. Rather, I insist on orchestrating a finish that does not leave maddening loose ends, and then trust my imagination to build the bridges. The twists and the turns of the tale always take their own adventurous course. At its heart, the series concerns the relationship of two royal half-brothers, Lysaer, the Prince of Light, and Arithon the Shadow Master, who have been cursed by the Mistwraith to be at war with each other. Now normally, in a series entitled The Wars of Light and Shadow, one would assume that the Light are the Good Guys and the Dark are the Bad Guys. But in this series, things are not quite so simple. It is said that history is written by the victor -- which makes for some slanted versions of past events. Yet in your series, you seem to make the reader draw her own conclusions as to who is right and who is wrong -- and who may have good intentions, but is misguided. Did you consciously set out to write a series which would stretch your readers? When you first had your idea for the books, did you have any idea what a mammoth undertaking it would be? I get bored silly, being told who the villain is, and being able to second guess the next line. Life itself is far more intricate. One never knows -- one has to discern, or risk swallowing everything as given. Well, what we are "told" is not the whole truth. Sometimes the "truth" has been twisted or colored to fit an ideology, an agenda, or smoothed over so it won't rock anybody's preconceived notions. I absolutely did write a book that would compel the reader to discern! This story will demand a reader who thinks. It was written for the individual who doesn't want to be told, or led by the nose. The characters are going to act their beliefs out on the page, and they won't do this according to "formula." The story takes no one, and nothing for granted! Are you a brave reader? Can you handle a character you can't second guess? How well can you listen, how well can you discern, and how clear are your eyes, for perceiving what is really happening on the page -- not what you think ought to be there. Can you handle the setback, if what you presumed turns out to be wrong, and then are you courageous enough to fall into the fascination of actually discovering what is meaningful for yourself? I'd like to think I respect a reader's intelligence enough to let them form their opinions according to their merits. through in a blind hurry, not caring enough to examine the details. It's a story that's designed to ask difficult questions -- and to look well beyond surface appearances. Which is a reflection, perhaps, of our complex modern lives, where information is thrown at us from so many angles. Who is right? Who is wrong? So much depends upon viewpoint! The person who hates this or that always feels they are justified -- but who is telling the story about the ones hated? So, absolutely, yes, I set out to craft a story about a "hero" the masses followed, for the "right causes." Except with a difference -- you are going to know the whole truth, you are going to sympathize and see through the eyes of the hunted. If this book doesn't leave you with the sort of displaced feeling, that "there but for the grace ..." that if you hadn't known both sides of the picture, you might have fallen for the same lies, then I missed my set mark. I wanted the poignancy of that understanding to seed an irretrievable sense of sorrow, that maybe, just maybe, all things are worth treating with careful discernment. No, absolutely not, I didn't realize at first what a mammoth undertaking this was going to be! But then, early on, yes, I did, and from there forward, I gave the scope of this project the wary care it deserved. This involved restraint and the wisdom of not putting it on the market too soon. I had to learn my craft, inside out. This meant investing decades of work before the first novel came out. When Curse of the Mistwraith sold in the USA, it was a finished novel, and the whole series framed out to the point where it was all of a piece -- it had evolved until I knew where everything interconnects. I won't be exploring the world on the page. I know the characters I am writing, and the awareness is precise, as to why this scene and that action should be shown, and exactly where its going to lead into the finish of the tale. In the early days of trial and error, the first chapters of Curse of the Mistwraith were written seventeen times -- all from different starting points. But I waited until I knew for certain I had the best one to launch from. In fact, all of the foundation for the entire series is in that first volume. If a reader returns to it, at any stage, or after each sequel, the events can be reinterpreted at a more involved level. The series is designed to yield deeper insights at each review, something the more devoted readers have discovered. They can reread these books ten times, and continue to perceive new sets of insights. The books raise some rather disturbing questions about the conflict between one's personal duties and loyalties versus one's duties as a responsible citizen of society. What do you see as the main themes of the series? I see this as one of the conflicts of awareness of our times -- that we so often live the concept of the "greater good." That the ills of society can be healed from without, by systems of thought or government. This leads us to generalization -- that what is good for the many supercedes what is good for the one. That, so much more sadly, the "idealized" ends justify the means. The opposite viewpoint appears to conflict -- that if the integrity of choice is made every time on an individual level -- if each encounter is treated one on one, in compassion -- what happens? I decided to explore this, and therefore, the two characters in the series follow separate ideologies -- the one, Lysaer, is the ruler, who strives always to act for the "greater good" of society as a whole. And the other, Arithon, who is mage trained to perceive in detail, who will always react on his individual integrity. One will manipulate and control others for their supposed benefit, the other will tell himself the truth. The contrast between these opposing stances will ask difficult questions -- because the "greater good" will be somebody's ideology, and to adhere to any fixed set of principles blindly makes any fervent follower into a tool. The greater good does not doubt itself. The individual with integrity doubts constantly, and so, must develop discernment, case by case. This is just one of many themes that play through in this series, though not in a judgmental way. The reader is left free to choose what to think and feel for themselves. The magical elements of the book are quite fascinating, and very detailed. How did you develop the system? It also seems that we haven't quite learned everything about this magical system yet -- that there is more to be revealed in later books? Above all, I like to create systems that appear to work! Pouf, and it happens, is not for me! I started out studying to be a scientist, until all that I perceived in the world just refused to fit neatly into that box. I had to step outside and look deeper, to find answers that had meaning, unless I continued down the beaten track and just lied, that no, what I saw was not real. Well, my readers aren't stupid either! They might not buy the simple "it's so just because" type of reasoning. The magic in Athera had to satisfy my own sense of wonder, depth, and complexity first -- just out of respect for our human intelligence, and our incessant desire to think. The primary underpinning for Athera's magic is actually derived from particle physics! Look deep enough, matter is energy in motion -- light is waves and it is particulate -- break down the units that make up an atom, and you find these increasingly tiny bundles of energy, filled with these incredibly lovely paradoxes. Run them again, but at a mystical level, and wow, you might just encounter this amazing tapestry! A universe that is matter, but that actually, is illusion of formed energy -- light and sound, and resonance -- now you're cooking! If positive and negative charges -- electro-magnetics, gravity, strong force and weak force form our solid world, and our thoughts are in fact electro-chemical transmissions, and everything in nature has a polarity -- we are experiencing the result of these forces, interacting. That's a concept for magic at its very best! Athera's magical systems begin there, and then diversify -- how do you approach the process of manipulating that universe of forces -- do you use force of will overtop, maybe amplified or contrived, to make things change as you wish -- or if such a universe is conscious, in fact aware of itself, would you work in harmony with that beingness. In short, how might you gear your system of access to alter the mix of natural forces? In a multi layered book, and a complex society, there will be more than one field of belief, and more than one means of access. Like the story, the characters, and the interaction of political factions, each volume will unveil more and more of the magical system until, at the end, the tapestry is fully woven. You won't be left guessing, you'll understand how the threads mesh. If one takes time to study the various schools of thinking on our earth, one might discover similar points of correlation. An aware universe, versus an objective one, for instance -- where consciousness might direct evolution, rather than blind chance or necessity...there are many fascinating angles into the various systems of human belief on our planet. I am writing fiction, make no mistake. However, I definitely strike to make that fantasy world deep and real enough to relate to our cultural diversity, and to the complexity of the natural world our eyes and the instruments of our current science are too coarse to perceive. As a writer, you are known for your lyrical use of language, complex characters and interesting plots. When you started writing the Alliance of Light and Dark series, how did you choose the "voice" or writing style for that series? Were there any considerations that went into your choice? Now this is an interesting question! Every story has its voice. This is essential to framing the tale. For this series, I deliberately chose a slow pace on the page, with detailed, intricate use of language. It demands a certain focus of attention. I fully realize this flies in the face of the "simple is better" school of thought! However, this is no simple story, but one that runs through layer upon layer upon layer of complexity, all interlocked! Therefore, put straightly, I had to slow the reader down! If I cut the action scenes to the bone, which, yes I could, then wham! you'd hit up against a magic sequence where the pace must slow to let through the multi-layered intricacy of the concept. Suddenly, in a line, we're looking at maybe nine levels of stuff going on: what the character is feeling, what they're seeing, the logic behind what's going on, and then its full range of causation, on more levels than the eye can perceive. If the rest of the books was done in a lean style, the reader would hit this scene at a "sprint." They'd impatiently try to slam through to see what happened, and in the process, come to miss everything. Not only that, but they'd never remember all the fine points that caused that scene to work in the first place. The books do not lack for fast pace or action, just the on page style demands a high degree of attentiveness. This is required, to achieve the depth inherent in this particular story. There are so many subtle clues as to how a character thinks and feels that are critical to letting the reader discern that character's orientation and ideology and viewpoint. If I just cut to the chase, and showed the dialogue without that added fillip of the thought and feeling behind each line of spoken words -- a reader would not have the insight to enact such a fine-tuned appraisal. They would not have the background to experience how they felt about that character's reaction. Without that level of understanding, what I'd have is chaos, since the reader's own script, thought/feeling, would go in between those blank lines. Therefore, I had to spell it all out, intricately, in detail, and let the completed experience be set on the page. I truly wanted these books to have impact. Read them, and you will live an experience. You will walk in the characters' shoes, and you will know how they think and they feel -- and you will be in that room with them, or on that particular crowded street, or on that wild mountain, and you will remember as they lived the experience. Not every reader wants to slow down and allow that sort of intimacy. Not every reader wants to take in those incredible depths. These books, then, are not for them! I set out to do something very real, and that very edgy state of realness will not always be comfortable, nor will it please everyone. And that's OK! I have other books written in looser style, and there are shops full of stories by other authors to choose from. Reading is such an individualistic taste. I selected to write for the involved reader, and not to strike for middle of the road ambiguity. I wanted to touch something genuine, with a distinct sense of individuality and identity. The language in these books won't let you lie to yourself. You either give in, accept the ride through the character's eyes, in which case, you will think and feel outside of yourself -- or you get out and go someplace else. How has your love of music influenced your writing style (if at all)? I have always loved music, and been fascinated with the tonalities, the dissonances, the way music can build mood and alter emotion. Surely, in a book with a musician as the hero, all of this has come into play! 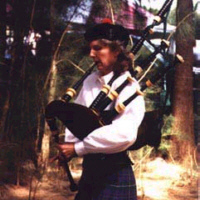 I've had the privilege to study the Highland Bagpipe under a man who is a world class musician -- and the intricacy of his understanding is astonishing. That he can pass it on, even more so. I've certainly used such insights, and also, my lifelong enjoyment of stringed instruments, though those have been more in the line of an engrossing hobby. How did you create the character of Arithon? Were there any characteristics that you were specifically trying to avoid with him? Actually, the better way to view this would be, how did Arithon create himself? To begin with, he's a musician. Hang around with musicians, and you're likely to see a group of people who are in sensitive touch with their emotions. They hear and feel with a nuance that is immediate -- therefore, Arithon would have to have those qualities. He has mage talent, inborn, and was raised by mystics. His upbringing, then, would have schooled his self-awareness to an exacting degree -- had to have done so, for him to achieve mastery at a young age. Add his innate royal gift of compassion -- now you have the primary characteristics that drive him. Add on the template of his life experiences -- his framework of dreams, both realized and shattered, his fears, his hopes, his aspirations, and his list of things that are precious -- put these together, and set him on stage, he will react according to himself. That's how he "is" not how he was contrived to be. I can't say what I was trying to avoid -- except that kicked-to-death old stereotype, of the dark guy who does the thing with the shadows is EVIL. That is the myth I want shattered, and who better to do it than a character of such deeply caring intensity? How did you approach writing Lysaer? What was the greatest challenge in creating this character? Challenge is the key note, here. Lysaer's scenes are always the hardest, or at least, the most disturbing to write. He was raised to rule fairly, to put his personal needs second to the greater good of society, and he will always answer to the moral high ground. Therefore, whatever despicable thing he might be doing, he's got to believe he's the hero -- and if I get it right, the reader has to see enough of that belief, not to fall for it, but to understand to a pernicious degree that they might have, if they didn't know all the facts. Lysaer's justifications are indeed refined, intricate, noble lies. The nobility is the difficult part. It has to be there -- and because it's a lie, it's not comfortable, as an author, to go into his ideology with conviction. He plays as arrogant, but at his deepest level, he must play as a human being, totally convinced he is genuine. That's a paradox with the disturbing edges -- particularly when it rubs against the fair, right minded ruler who should be heroic -- who acts in heroic scale -- as long as one stays blinded to the overall effect on both sides of the outcome. The battle scenes are quite violent and disturbing -- they certainly don't glorify war or violence as a way to solve problems, or make charging into war seem at all attractive or glorious. What went into your decision as to how to handle the issue of violence in this series? I had set out to write a book that centered on a major conflict, and being something of a fusspot, I had to get the background right. Since Athera's development is not quite in lockstep with Earth's, I had to do massive research into weapons and tactics, so that when I put the battle scenes together, they would be believable. I studied campaigns, weapons, all that, from the Romans to the point where gunpowder began to shift the way wars were fought. Filled with all this information, I walked, blind, into a documentary film about the battle that occurred on Culloden Moor in Scotland. Put simply, it shattered me. The facts of that "war" were set on screen in stark black and white, without any of the romance, any of the rosy glow put in the history texts, without any of the fluff our entertainment industry has built around Bonnie Prince Charlie, and the last rebellion of clan power in Scotland. I walked out, literally reeling. It made me replay in my mind all those factual campaigns I had just studied, but from a starkly changed perspective. I was enraged. I felt betrayed. That I could have lived into my college years, cocooned in the myth, that the brutality of war solves anything -- that such an ugliness could ever be a justifiable means to an end, was quite horrifying. Whichever side is victorious, the dead are still brutally slaughtered. Not only that. I realized, in one hour, that society tells itself incredible lies, and that people buy them. Our schools and our educational system endorse them. Our entertainment exploits them. And on a global scale, our young men (and sometimes women) march onto the field, and pay the price, and face the wrenching reality. Fantasy literature surely is one of the primary offenders -- you know, one side is "good" and it fights "evil" and then the heroes go home with the laurels. Well, on that afternoon I was forced to rethink all of that, set against the harsh perspective of a good chunk of mankind's warring history. I had to admit what was not explicit in those "factual" books -- that the winners were likely just more numerous, better organized, or had a better general, or more brilliant tactics. The "great battles" were in fact horrific records of slaughter, in which good had little or nothing to say in the outcome. And there were no exceptions. Every single conflict was just butchery, of one side, or the other, or both. Then the victors wrote history. Whoever "won" -- "right" or "wrong" -- there were always indelible wounds. Lasting wisdom is not guaranteed by force, and "might" has exactly nothing to do with "right". Here I was, in the middle of plotting this incredible manuscript, and I could not write the lie. Not anymore. And in the nature of such things, I suppose I was at the right place, at the right time -- because with such a story, very beautifully, I didn't have to. It's not been easy. In fact, there are distinct moments when it's been downright harrowing. I recall finishing the ending scenes in Curse of the Mistwraith, shaking and drained, and wondering honestly if I had just put the proverbial bullet through my career. However, I had to stick by my conviction. Time and posterity will determine what's on that page, not me. I did what I set out to do, which was to rip the mask from killing wars for a "justifiable" cause. There is this sorrowful belief that violence can heal, but truthfully, it does not. Whether this concept has a lasting place in our literature -- the readers themselves become the final arbiters, and the ultimate judge of the impact. The volumes to come in this series will step through a new doorway, and explore a new way of thought, maybe. Peril's Gate sets Arithon down at a crux where he must change -- in the hot seat of a society not prepared for that change. There lies the challenge of Stormed Fortress, (the next volume) and perhaps, one that must face our own world very soon. If we choose to step off the merry-go-round, if we stop trying to "solve" by killing, where do we go? I write in a room that was a made over garage, in my home, which is in the country. I like close contact with nature. The setting itself is too small to hold everything, therefore, try though I might, it gets cluttered. I use a computer with a flat screen, and it's surrounded with all sorts of esoteric stuff -- books, rocks, things I found hiking, sheets of piping music, niches for the cats to sleep (or else they'll sleep on my manuscript.) There is nothing fancy, except for the stereo, which is first rate. I derive much of the mood and background emotion from music, and I do not limit my CD budget. If I'm going to live writing, I'm going to do it with as much panache as I can, and that means quality sound because I can appreciate the difference. A typical writing day? Starts early with feeding the horses, so a trip outside is first thing. I sit down to work after breakfast, and usually compose manuscript all day. In late day, after five, I might go riding, hiking, jogging, or off to a music lesson, or play my pipes. Evening, I often write more, or refine some draft, or I might read a book. I keep late hours at night, but not always. In between all this are the cats, the husband, his works in the art studio, and the usual little details of answering mail and accounting. Between novels, I like to go backpacking, or sailing, or skiing. I don't keep what I consider a set schedule -- if something interrupts, or I get diverted or fascinated by something, I try to let that spontaneity happen. So often, what I thought was a "guilty pleasure" turned out to be just exactly what I needed to write the next book! I keep a map of Athera posted on the wall, and of course, many of the paintings of the characters are in this office. Click here for the second part of the interview.